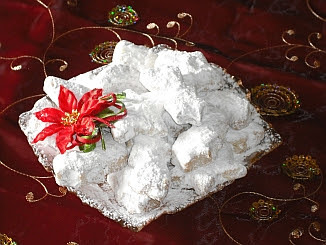 As promised, we have the other main Greek traditional Christmas sweet - Kourambiedes. These contain a touch of ouzo as you can see, and it shouldn't be difficult to obtain some where you live as it is popular internationally. Place the almonds in a shallow oven dish and bake them in a pre heated oven at 180 degrees C for about 15 minutes until they are slightly brown. Let them cool and then roughly chop them. Place the butter, which should be soft, in a mixer with the icing sugar and beat well with the cake beater for 15 minutes. Add the egg yolk, ouzo and vanilla powder and continue beating for another 5 minutes. Add the baking powder and almonds to the flour, add this mixture to the mixer and beat for a few seconds until the flour has been absorbed by the liquid. Take pieces of the dough, trying to handle it as little as possible, and make them into the shape you want. Normally they are oval, but you can also make them circular, star-shaped, crescent-shaped etc. The thickness should be about 1½ cm. Place them on non-stick oven dishes and bake in a pre heated oven at 160 degrees C for 20-25 minutes. Allow them to cool, then dip them in icing sugar and place them in a layer on a Christmas decorated dish. Sprinkle plenty of icing sugar on top of them and then place more layers on top in pyramid fashion. Sprinkle plenty of icing sugar on top of each layer. I´d like to wish you a Good Christmas! Hello Symposio, Merry Christmas to you and your family! hope your christmas would be filled with love, cheers and good tidings. merry christmas!!! Really nice blog. I love it. Make me hungry. Have a happy new year. Happy New Year my friend and I wish you all the best for 2009! Thnks for all your delicious recipes that you brought us in 2008!